Join your local host Helene at her spacious, open kitchen and learn to cook an authentic Jaliscan meal from handed down recipes perfected by Helene over the years. You and Helene will prepare three dishes from scratch and she will teach you some master cooking techniques. 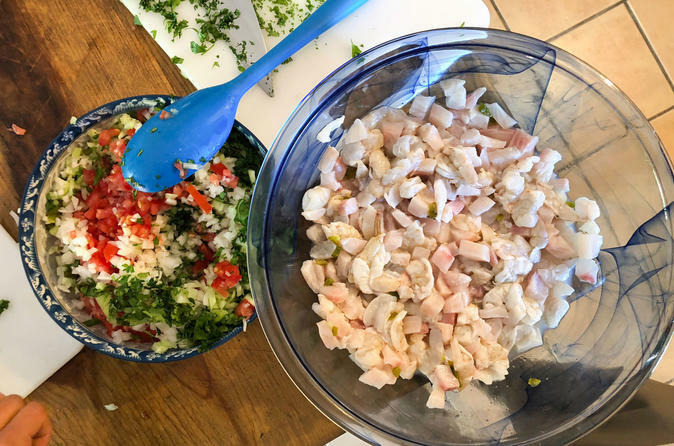 You will learn how to perfectly chop ingredients for the best tasting salsa, how to marinate your meats and how to fry a whole fish to perfection! Your meal may include dishes such as a seafood ceviche, a whole snapper (a typical Puerto Vallarta fish) fried in oil and garlic and served with a mango and cilantro salsa, carne asada from the barbecue served with tortillas and salsas, or birria, a flavorful goat or beef stew simmered in tomatoes, chilies and garlic served with tortillas and refried beans. The cooking class will last about 1.5 hours before you sit down to enjoy the meal you helped prepare. What a great way to dive into authentic Mexican culture and cuisine! Helene is a native Canadian who moved to Puerto Vallarta 15 years ago and immediately began traveling the country with her newly found Mexican friends. Her favorite part of her travels was tasting everything and returning home to recreate the flavors she tasted and loved throughout Mexico. She loves cooking together with her friends and is known for making 150 tamales at a time! Helene lives in a beautiful hacienda-style house in a typical Mexican residential neighborhood (not an expat neighborhood), so you will get an authentic experience of the local culture. Her house on a local dirt road is furnished with Mexican antiques and has a beautiful garden and pool. Helene speaks Spanish, English, and French and is a great host for people coming from around the world.